Only 2.9 million of us were watching the Miss USA pageant last night, according to Nielsen. So, we’re to be forgiven if none of us noticed another story of the pageant, than the crowning of Miss Washington DC, Kára McCullough. Kára is not your typical beauty pageant contestant. She’s not using the pageant as a stepping stone to a modeling/television career, though her headshots may make you think she has a Plan B on standby. Nor is she a struggling student entering the pageant for a chance to win the money to apply to college. Kára is finished with college (so far) and already has a pretty good job. The new Miss USA is a 25-year-old scientist who works at the U.S. Nuclear Regulatory Commission. So, to say this young woman is smart could be an understatement. Unfortunately, her answer to the obligatory ‘pageant IQ question’ is not. 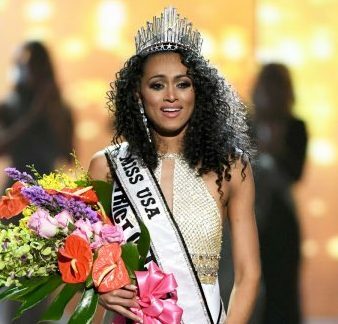 While some of her peers were asked questions like: “Which specific issue regarding women’s rights is most important to you?” or “What action would you take as Miss USA to help [suicidal] teenagers?,” Kára’s question had to do with healthcare. Needless to say, Kára’s answer sent a tremor through social media. It’s too easy to criticize this 25-year-old, who, though she has an advanced degree and a position making her a poster child for the current push to encourage more girls into STEM careers,answered in a way that reflected a very narrow range of experience and lack of understanding that having a job doesn’t necessarily ensure getting healthcare – or even affording it. Rather than pick apart Kára’s answer, as I’m sure many have done already, I’d rather focus on the bigger problem this young woman’s answer epitomizes: Privilege. Having healthcare is not the privilege in this equation. It’s a by-product of the privilege of receiving a degree, being offered a job that pays not only a good salary but includes the benefits that ensure healthcare coverage. Certainly, there are varying degrees of privilege but they all have one thing in common – privilege acts as a prejudicial filter to how a person perceives the world. A person with privilege may not understand, or forgotten, what it’s like living paycheck to paycheck. A person with privilege may not understand why the Civil Rights Act is still needed. A person with privilege may not understand why, for some, Obamacare was a godsend. A person with privilege may not understand why in some communities law enforcement is feared rather than seen as an agency of help. A person with privilege may not understand why or how life is so bad somewhere that people are willing to risk their lives and personal safety to reach the US side of the border. A person with privilege may not understand how some parents choose to pay rent over buying food for their children. A person with privilege may not understand someone working 18-hour days, at two jobs, still doesn’t have healthcare but will have a smartphone. A person with privilege may not understand why can’t everyone just get along.